The BC startup community touts government incentive programs as one of the best reasons to start up in BC. The programs are pitched as equalizers that make up for BC’s distance from Silicon Valley. If you’re a BC-based startup, you’ve likely bought this pitch: you’re registering your corporation for investor tax credits, applying for government grants, and being told to count on the government refunding a generous portion of your technical salaries. What you haven’t been told is that these incentives can hurt your startup, even as they benefit investors and larger technology businesses that can absorb the cost of participation. These programs sabotage otherwise-nimble young companies by introducing crippling bureaucracy, hundreds of hours of busywork for founders, and tens of thousands of dollars of new costs. Participation is effectively mandatory, since early-stage startups that eschew these programs will struggle to compete for local investment and employees. Founders who decide to play ball, however, will find that their startups receive no net benefit from participation, as the programs’ subsidies have already been fully priced in to the ecosystem. The EBC program provides a 30% tax credit to BC angels who invest in eligible startups. The credit is repayable by the investors if the EBC-eligible startup is acquired within 5 years of the tax credit being issued, or by the startup if the shares are redeemed within the same period. A dedicated founder might purchase shares in their own startup’s fundraising round. This investment is a positive, healthy signal, and should be encouraged. But EBC investment credits are only available to investors that control less than 50% of the startup’s voting shares. This restriction holds even if the fundraising would dilute the founders to less than 50% control on completion. That means if two co-founders create their corporation with each owning 50% of the voting shares, they will not be eligible for the same EBC investment credit that their external investors receive. The founders, when buying shares in their own company, effectively pay 42% more (by missing out on the 30% credit) than external investors. Businesses that have raised less than $500K may file a Notice to Reader to satisfy the annual reporting requirements. […] Once an EBC raises $500K or more from investors under the program, a review engagement report will be required with each annual return filing. If an EBC startup raises $500K or more, even across multiple small rounds or multiple years, a typical Notice to Reader year-end engagement is insufficient. The startup must instead hire an accounting firm to perform a Review Engagement. A Review Engagement is typically three times the cost of a Notice to Reader, and the startup must pay this higher fee for the next five following year ends, regardless of whether it ever raises capital again. 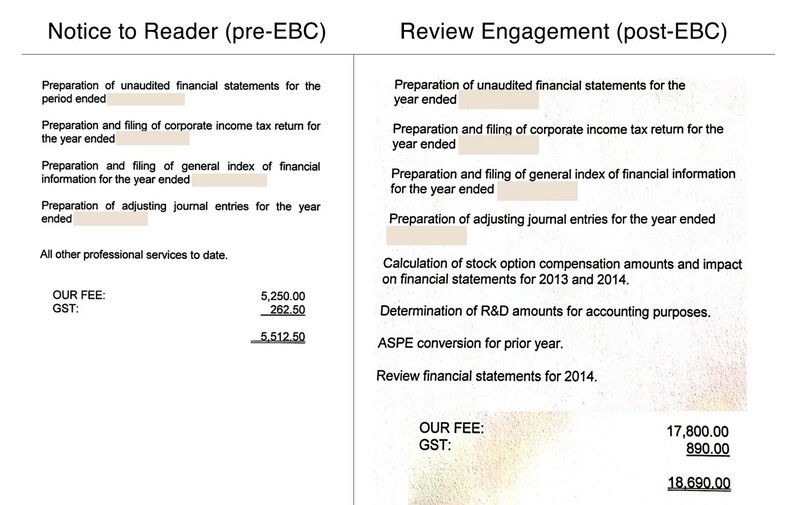 Below is a comparison of a bill for a Notice to Reader (pre-EBC) and a Review Engagement (post-EBC), for the same startup, from a reputable accounting firm. Notice to Reader bill for $5,250 (FY2013) vs. Review Engagement bill for $17,800 (FY2014). Some elements redacted for privacy. Receiving EBC status requires founders to complete a manual certification process with the BC Ministry of Finance. Once certified, startups must then request an allocation (“Equity Authorization”) from the EBC program’s annual budget. There is no guarantee that the EBC’s budget will be sufficient for all applicants, and allocations are provided from the program’s limited budget on a first-come, first-serve basis. If a startup has unlucky timing with its round and does not receive an allocation, its shares will cost 42% more than a comparable deal that did receive an EBC allocation. The National Research Council’s Industrial Research Assistance Program awards non-dilutive grants for the research, development, and commercialization of technology by Canadian small businesses. NRC-IRAP contracts require lengthy project proposals, ongoing documentation, and regular meetings during and after the project’s completion. Contribution amounts can be as high as tens of millions of dollars. For most startups, the grant amounts are a percentage of their technical salary base. NRC-IRAP contributions count against a startup’s ability to claim other incentives. A startup should only seek an NRC-IRAP contract if it intends to develop and commercialize the contracted project’s work for five full years after the project’s completion, or it risks being ordered to repay NRC-IRAP’s contribution. NRC-IRAP has the right to demand full repayment of its contribution (plus interest) if a startup breaches any condition during the five years after it finished its project. (Some NRC-IRAP contribution agreements are even more punitive, demanding the repayment of a multiple of the contract’s contribution.) A startup that received NRC-IRAP support within five years of going bust should plan for them to come collecting. Contracts are only awarded to firms that can prove their ability to develop and market the project without NRC-IRAP’s contribution. Projects that are deemed reliant on NRC-IRAP’s support will not be accepted. If, during a project’s development, NRC-IRAP decides that a startup no longer has the ability to complete the project or commercialize its fruits, it may find the startup in breach, cancel the contract, and demand repayment of any contributions made so far. NRC-IRAP contribution agreements specify that a “negotiated exit” from the startup’s long-term commitments is possible, via an undocumented process for pleading for a reduction in the firm’s repayment obligation. This is entirely at NRC-IRAP’s discretion, and NRC-IRAP reserves the right to place further restrictions on the startup as part of the exit conditions. NRC-IRAP attempts to award grants on a merit basis to qualified small businesses in capital-efficient technology industries. Federal government employees called Industrial Technology Advisors (ITAs) are responsible for evaluating grant proposals for feasibility, commercial potential, and the startup’s strength as a business. ITAs must consider grant applications based on factors that include “the technical aspects of the project and its potential impact on the [startup]”, regardless of their level of industry or technical experience. Because the NRC-IRAP program has a limited budget, contribution contracts are rivalrous — not every qualified applicant will receive a grant. And since grant applications are evaluated by government employees on subjective measures, the ITAs whose job it is to dole out this budget are picking winners and losers. The SR&ED program is a massive tax incentive administered by the Canada Revenue Agency (Canada’s IRS). It provides a tax credit for research and development done in Canada. For startups, this most often means that some portion of their engineering or computer science work can be claimed as a refundable credit at the end of a fiscal year. Recent CRA changes have introduced a lengthy claim process that requires startup founders and employees to spend weeks or months away from their work while fulfilling CRA demands. To claim SR&ED credits, a company must have hour-by-hour time accounting of all employees engaged in research and development. Employee time must be clearly demarcated between SR&ED and non-SR&ED work. The demarcations must be exactly supported by evidence: contemporaneous time sheets, project management logs, commits, and so on. Founders are required to collect, analyze, and submit all evidence related to the SR&ED-applicable work — screenshots, tickets, commit logs, milestones, Gantt charts, emails, chat logs, etc. — in order to justify their claim. The CRA will carefully scrutinize time tracking at an hourly level, and exclude any time engineers spend outside of their strict definition or SR&ED-able activities: putting out fires, deploying bugfixes, and implementing a new feature on a second platform are all ineligible. Whether salaried or paid hourly, a research-engaged employee’s every working hour must be provably attributable to one or more SR&ED projects to be eligible for credit. Time attribution by source commit (messages redacted). Claims require at least this level of detail for all relevant employees, although the CRA prefers per-hour time sheets. Every individual piece of supporting evidence must be pigeon-holed in to one or more of the 12 mandated Kafkaesque categories, like “Scientific or technological uncertainties” and “Test protocols, test data, analysis of test results, conclusions”. For a startup with a 5-person engineering team submitting its first claim, the CTO should expect to spend at least 160 hours documenting SR&ED projects, preparing the claim forms, and satisfying review demands. This does not include time taken by any review meetings, where founders are also required to make available any of the startup’s employees at the CRA’s behest. The volume of work involved in preparing an SR&ED claim, submitting it, and defending against a review might tempt founders to hire a consultant to assist with the claim. But the CRA punishes founders for hiring third parties to assist with claims. Engaging a third party for claim preparation is a red flag that increases the company’s odds of having its claim audited. 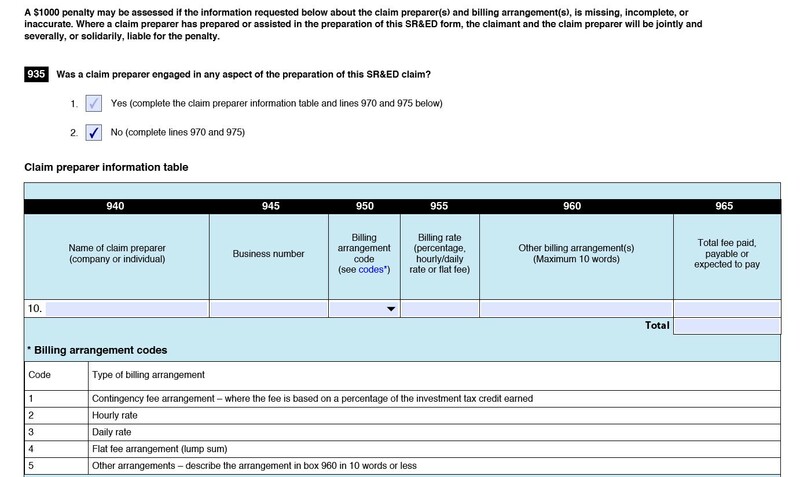 The CRA detects this by obligating startups to disclose whether it received claim preparation assistance from a third party, as well as the third party’s billing arrangement and the exact amount paid for assistance. This recent policy change is ostensibly aimed at reducing abuse by aggressive consultants operating on contingency fees. Instead, it forces founders to choose between navigating the intricacies of the SR&ED program themselves or increasing their chances of having their claim selected for review. Larger companies can afford to stay under the radar by hiring an internal business analyst, project manager, or technical writer to prepare SR&ED claims as an employee; these options are not available to early-stage startups. The CRA has committed to auditing 25% of all SR&ED claims annually, with a disproportionate number of those reviews targeting first-time claimants. The review process is gruelling. The technical portion alone requires founders to create bespoke material just for the review. New algorithm diagrams, definition tables, timelines, product demonstrations, and any other material may be ordered from the startup at the CRA’s sole discretion. Then, the company must wait for a team from the CRA to schedule an in-person meeting at the company’s office. This can take months, depending on the personal schedules of the assigned CRA reviewers. During the review, the company must produce access to any evidence and employees that the CRA requests, or face prosecution. The company is prohibited from recording the review, and CRA reviewers are ordered to refuse to sign non-disclosure agreements before demanding the disclosure of sensitive information. Startups with claims under review should expect a delay of at least six months from filing before receiving confirmation that they are eligible for their refund — an eon in startup terms, especially if the founders are occupied with government paperwork to move the process forward for the duration. Refunds routinely take an additional 2 months to be issued even once eligibility is confirmed. No matter how removed from true research a startup’s work is, its investors will still expect it to apply for refundable SR&ED credits. They may undercapitalize the company and expect SR&ED to pick up the slack. Or, the founders themselves may be guilty of relying on non-dilutive SR&ED refunds instead of seeking additional equity financing. Investors, because of their certainty that companies will receive SR&ED refunds, will ask a startup’s board to book SR&ED credits for each month’s research expenditures as receivables. This aggressive accounting is common even though the lag from expenditure to refund can be 18 months or more. It also doesn’t account for the fact that claims are frequently adjusted downwards (or denied altogether). Surprise claim processing delays that critically affect a startup’s cashflow are endemic to the point that an entire SR&ED refund financing industry has sprung up, offering short-term loans at high interest rates to bridge the delay between expenditure and refund receipt. BC is a fine home for startups — but that’s despite government incentives, not because of them. It has enviable cities, liberal social policies, and the second-lowest corporate tax rates in Canada (much lower than California). It’s full of world-class developers and has a lively startup community. Choose BC for these reasons, not for the unavoidable incentive programs and their requisite mountain of bureaucracy. If the provincial and federal bodies responsible for these incentives want to offer startups effective tools instead of crippling burdens, a hard look is needed at the true cost that founders incur by participating. It shouldn’t take a founder months out of each year to manage these programs. Until that changes, these incentives only benefit investors and large businesses, and startups just get the paperwork. Decent guy. Co-founder of Tapstream.